This past May (2013) I had, or made, the opportunity to FINALLY scratch Norway off my bucket list. Friends, I am here to tell you that the land of the Vikings does not disappoint. It is staggering and relentless in its beauty. So much of this sparsely populated country is all but unspoiled. I was there for only ten days… A bare scratching of the surface. I feel for those whose only view of Norway is from a cruise ship and a few stops it makes here and there, because these people miss so much…. 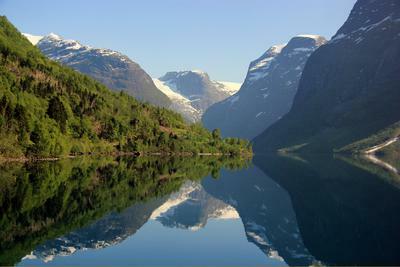 Norway IS a handful, starting with its size (1000 sq mi larger than Montana) and its eternally long coastline. Add to that the fact there are, for all practical purposes, NO superhighways anywhere, save for a few scraps here and there in urban areas like Oslo and Bergen. If you drive, be prepared for stunning scenery, but narrow, substandard roads to drive on. And PLAN your route, especially in fjord country. Be aware of roads where you must depend on ferry boats to get through. You can get in situations where you drive 20 miles… hit a ferry… drive 25 more miles… another ferry… 18 more miles… another ferry. We were so alarmed by reports of expensive everything, that we did something unprecedented in any of our previous European travels. We brought along a small piece of luggage I came to refer to as ‘the picnic basket’. It was filled with canned goods and all manner of munchies. It’s a good thing we did. We used practically all of it. Norway is big on camping and cabins. The cabins are fairly inexpensive, and have kitchen facilities where some of those canned goods were put to good use. The cabins are immaculate, cozy, comfortable, and are located in incredibly beautiful. 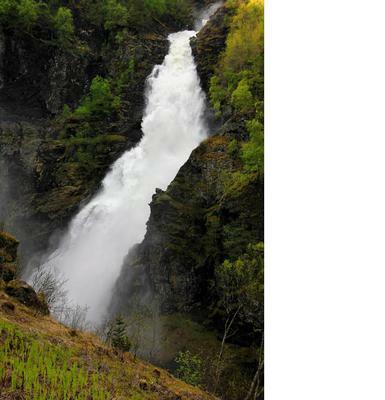 We stayed in one called Gudvangen Camping, directly across for the Kjelfossen. Awesome.. and peaceful. It never got completely dark the whole time we were there. The Sun would come up around 3:45 am, parade in a big circle around you all day, then finally dip below the horizon around 11:30 pm, for another ‘night’ that was not much more than barely twilight. It’s not that hard to adjust to, but if you think you’ll need them, bring sleeping blinders….